The rise of social media can no longer be denied. 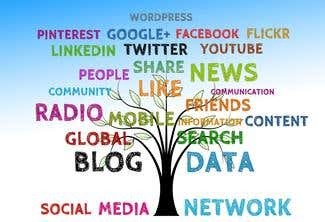 It’s in your best interest to ensure that you incorporate social media marketing within your overall advertising and marketing plans. That’s the only way to take advantage of the billions of people who use social media platforms. 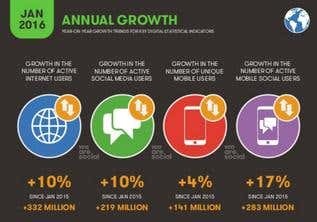 Here are some social media stats to consider for your 2016 plans for business. It's estimated that there are 1.968 billion active mobile social media users. Social media is no longer confined to desktop owners. There has been a significant change in who gets to use social platforms. If you want to run a business successfully, you must ensure that you target mobile social media users. This will require you to adapt your site as well as all the content associated with your brand to ensure that everything is mobile-friendly. Any ads that you use for marketing purposes should be adjusted to suit all manner of mobile devices, from smartphones to tablets. Every minute, people on Reddit cast 18, 000+ votes. In addition, every minute, Facebook users like over 4.1 million posts, Snapchat users share over 284,000 snaps, and Twitter users send over 347,000 tweets. Simply put, the potential for engagement is everywhere. You just have to know where to look for your audience. Find out where your target market is and you can use the right kind of content to enhance your online visibility as well as social media engagement. For example, if you have a short update on your business brand, you can release it via Twitter. Snapchat would be great for images that will help market your brand, and so would Instagram for that matter. The potential to raise your brand profile is immense, provided you use the right marketing strategies, at the right time for the right people. Positive comments about a brand can influence 63% of Facebook users. Do not make the mistake of discounting what people say about you on social media. That would be asking for trouble. What people say about your business matters—a lot. It will affect how potential customers view your brand. It will also affect how amenable they will become to purchasing the products you have on offer. For this reason, you should always endeavor to promote a positive view of your business brand on social media. This involves creating an account in the first place. It also requires that you are active on the platform on which you have your account. You want to be able to respond to any negativity that comes up. 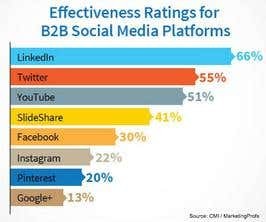 LinkedIn is the most important social media platform for B2B professionals and businesses. There is no doubt that Facebook is the global leader when it comes to the number of social media users. The site has over 1.5 billion active users! That, however, does not make it the favorite among business professionals. That honor goes to LinkedIn. Professionals believe that LinkedIn has an effective rating of 66%. Twitter is next with 55%, and YouTube is third. So, if you want to expand your business network and build mutually beneficial business relationships, LinkedIn is the platform to use. Take advantage of all the tools and resources it offers to grow your business. 52% of adults now use two or more social media platforms. These days, it's not enough for people to use only one social media platform. It does not matter how popular that platform is. Most people will be on at least two social media platforms. So what does that mean for your business? If you want to increase your business profits, you have to go where the consumers are. It pays to have multiple social media accounts. What works for Facebook, for instance, may not work for LinkedIn. The target audiences from these two platforms are vastly different. The former is more geared toward consumers. The latter, however, is best suited toward professionals. You have no choice but to be active on multiple channels. Otherwise, your competitors will leave you behind. Instagram Is the Most Popular Social Media Platform for the Youth Aged 12-24. Teens and young adults may not have a lot of disposable income, but they have tremendous influence over what their parents buy for them. They happen to like Instagram above all other social media channels. What this means is that young people are interested in visual content. So, give them what they want. Instagram is the place to be if you favor using images for your marketing efforts. They are more likely to be seen by your target audience. You should, therefore, have an Instagram account if you are aiming to attract a younger audience. Make use of infographics and high-quality images to enhance your brand’s visibility and sell your products. If you implement the right advertising strategies, you may be able to attract a target audience that is usually very fickle. There is a 50% more engagement rate for employees who are allowed to use social media in the workplace. To act as if your employees are not human is to be an ostrich with its head buried in the sand. Your employees will use social media in the workplace. It is ubiquitous. Creating regulations to prevent them from doing so and forcing them to comply is like swimming against a very strong current. You will waste lots of time, energy and money fighting a losing battle. 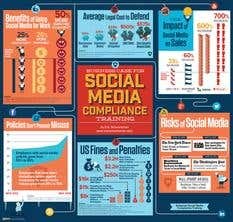 The key to harnessing the power of social media for your business is to allow employees to use it under strict regulations. Let them use it for communication. And while you are at it, allow them to use social media to engage customers and promote your brand and products online. That would be a much better use of your time. 46% of social media users will use the platform of their choice to make an online purchase. If people intend to purchase products online using the social media platform of their choice, you would do well to make it easier for them. Be sure to use your social media pages not only to enhance your brand visibility but also sell products. Post informative products on what you offer. Ensure that there is always a strong call to action. This will ensure that the undecided will make up their minds to buy with your help. Also, offer coupons and discount codes for social media users interested in what you have to offer. And, most importantly, provide a clear, visible link to your e-commerce store. In other words, make the buying process as easy as possible for any social media user on your page, especially those who are interested in doing business with you. Go a step further and provide multiple payment options while you're at it. And keep on engaging your customers every step of the way if you can.